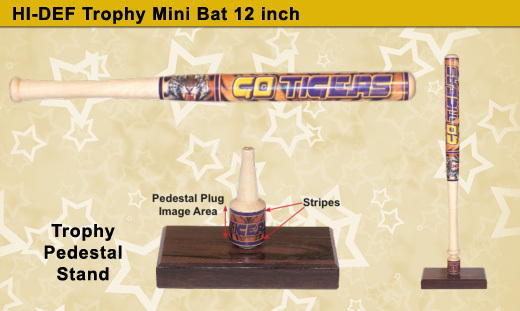 Displaying your bat is easy with our pedestal stand! Additional logos and text can be printed on the plug part of the pedestal. The bat can be removed from the stand for viewing and handling. Trophy Pedestal Stand: available in simulated walnut, white, or black. B12-IU Mini Bat has a barrel underlay of White (default), Silver, or Gold foil. Imaging can be placed on top of this coating. Large Bands (3) - optional, user selected color inside large bands on barrel. Small Bands (2 sets) - optional, user selected color inside large bands on barrel, Inner and Outer. *The products depicted herein are for illustration purposes only and do necessarily represent or imply the endorsement or sponsorship of any customers, companies or organizations.